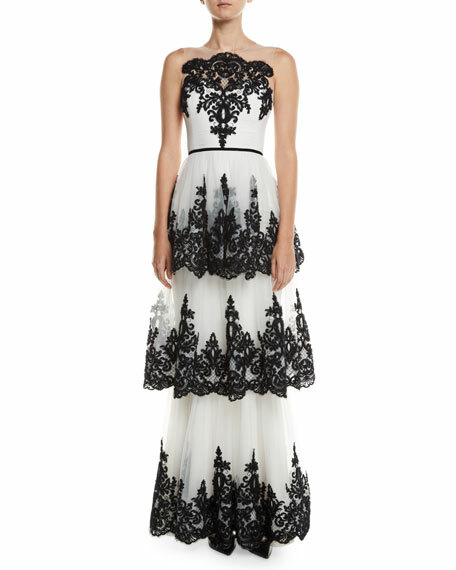 From the Spring 2014 Collection: "This is a gorgeous Victorian lace dress with a gathered hem." See all our buyers' favorites on InSite. Full skirt with high-low hem. After apprenticing at Balenciaga in Spain and at Lanvin in Paris, Dominican designer Oscar de la Renta launched his own eponymous line in 1965. His refined, ladylike looks garnered many awards, including one in 1990 for Lifetime Achievement. In 1998, he launched a successful line of lingerie; the house now includes collections of eyewear, fragrance, home decor, handbags, and shoes. Likely "Carlo" gown with flounce hem. Approx. 55"L down center back. Strapless neckline. Fitted princess seams. Fit-and-flare silhouette. Hidden back zip. High-low hem. Flounce ruffle trim. Polyester/rayon/spandex. Polyester lining. Dry clean. Imported. Marchesa Notte tiered gown with embroidery and velvet waistband. High-jewel neckline; strapless illusion; open back. Sleeveless. A-line silhouette. Hidden back zip. Three-tiered skirt. Floor-length hem. Nylon base fabric. Polyester/nylon embroidery. Imported. Monique Lhuillier gown in floral lace with scalloped trim. One-shoulder neckline. Long left sleeve. Column silhouette. Right thigh-high slit. Floor length. Train at back. Cotton/nylon. Nylon contrast. Made in USA of imported material.